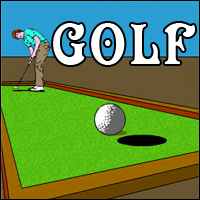 Description "This game concept is player goal the ball into the pole hole. Player has only 6 golf chances to goal the ball into golf pole, if player goal the ball in hole, it gives message cool. If not goal the ball ‘bad luck’ message are displayed. To hit the ball use space bar or any one of the arrows." Controls "Use space bar or any one of the arrow keys for golf stick movements. If player miss the goal, he got message bad luck."